The Mouth of Sauron (also called the Messenger of Mordor) was a Black Númenorean who served Sauron during the Third Age. Cunning and evil, he quickly rose to power and became a great sorcerer; as a result, he managed to preserve his life for thousands of years. He had become Lieutenant of the Tower of Barad-dûr and had forgotten his real name by the time of the War of the Ring, so devoted was he to Sauron’s cause. 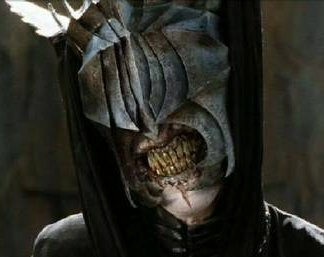 The Mouth of Sauron made a brief appearance when he is sent to treat with the Host of the West prior to the Battle of the Morannon. After insulting the Host and dismissing Aragorn’s claims as King, he tried to convince them that Frodo was dead and all was lost. But Gandalf did not believe him, and the Men of the West refused to give up. With that, the Mouth fled back to the Gate and unleashed the forces of Mordor upon the Host. He is not mentioned again after that, and his fate after the downfall of Sauron is unknown. Of course, in the movie, Aragorn neatly slices off his head.